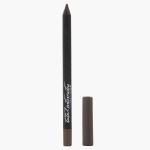 In an exceptional jewel tone, this eyeliner gives you a look like none other. It comes in a convenient pencil form with a smooth tip for easy, tug proof application. Devoid of parabens, it is gentle on your skin.